Sports teams traditionally establish goals well before their season even begins. While most are moderate in scope, La Salle High School’s ice hockey team pursued a pair of doozies — win the Flyers Cup, and then finish the year as state champions. The Explorers walked — or in this case, skated — the talk. On March 23 at Robert Morris University’s Island Sports Center in Pittsburgh, La Salle doubled North Allegheny, 6-3, in the Class 3A division for its sixth state title. 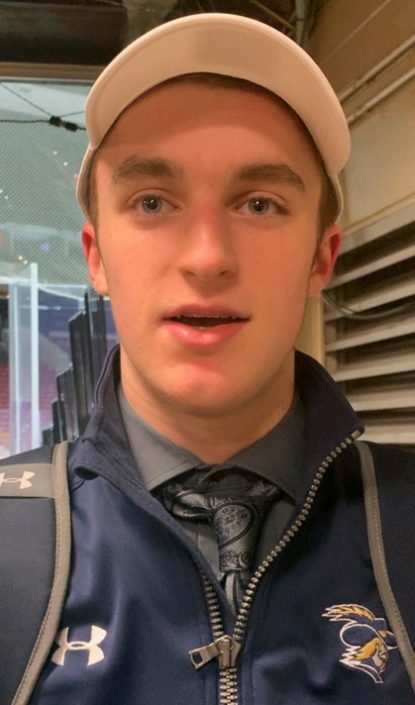 On St. Patrick’s Day six nights earlier at the Wells Fargo Center, the Explorers had dispatched rival St. Joseph’s Prep, 5-2, to capture the coveted Flyers Cup for the 10th time and sixth this decade. As they had done in the Flyers Cup, Sambuco and his linemates dazzled the crowd. Sambuco contributed a goal and three assists. Sophomore Sam Lipkin netted a hat trick and added an assist. Sophomore Mike Casey, the Most Valuable Player of the Flyers Cup, slammed home the other two goals. Lipkin’s short-handed tally in the third period broke a 3-3 tie. Less than nine minutes later, Lipkin contributed an insurance tally. “Winning the state championship is probably the highlight moment in my hockey career so far,” said Lipkin. “Winning with that group of guys, there’s no better feeling. According to Casey, the Cup victory over SJP was arguably more satisfying. Sambuco was asked to explain the top line’s dominance and penchant for scoring clutch goals. For instance, the Explorers were 28 seconds from being eliminated by Holy Ghost Prep in the Cup semifinals, but Sambuco tied the game in dramatic fashion. Then, in storybook form, Lipkin notched the game winner 17 seconds later. Casey assisted on both goals. Unfortunately for the rest of the state, the maxim “wait ‘til next year” doesn’t much apply because only four Explorers will graduate. Looks like next year’s preseason goals might be exactly the same as this year’s.